If someone asked you to design a world-class drone in only three days, what would you say? Year 10 student Stanley Shaw said ‘yes’. And it’s paying dividends. Seen as the future of Australian education, STEM puts Science, Technology, Engineering and Maths into real world contexts. To celebrate National Science Week, entrants were given the task of designing a solution to a very Australian problem: monitoring thousands of hectares of land, effectively. 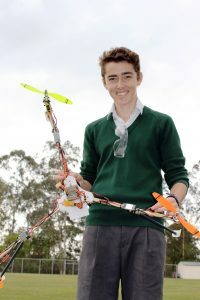 The Australia-New Zealand competition involved hundreds of schools with Stanley finishing in the top six. The competition was run in 2016 as a joint venture between Education Perfect, a leading online learning platform and the Australian Science Teachers Association. In 2015, The Australian Government committed $12 million to restore the focus, and increase student uptake of, science, technology, engineering and mathematics (STEM) subjects in primary and secondary schools. This came in addition to $5 million in 2014. With a passion for science and creativity, Stanley is well on the way to achieving his dream.